A man tumbles through wild surf, half drowned, to collapse on a moonlit beach. When he regains consciousness, he has no memory of who he is or where he came from. He knows only that the woman who washed ashore with him has disappeared sometime in the night, and that he has awakened in a surreal landscape of savage beauty—a mysterious watery world encircled by a thin spine of land. Aided by strange tribesmen, he will journey to the cover of the spine kings, a brutal race that has enslaved the woman and several of the tribesmen. That is only the beginning of his quest, as he struggles to find his identity in this cruel and dreamlike land—and seeks out the woman whose grip on his imagination is both unfathomable and unshakable. 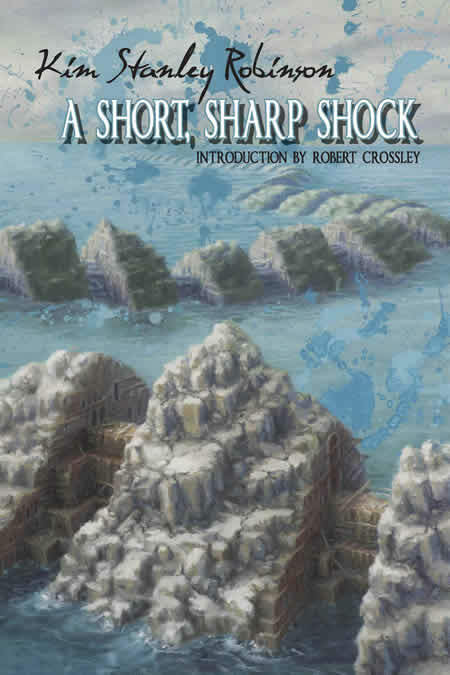 Haunting and lyrical, filled with uncommon beauty and terrible peril, A Short, Sharp Shock is an ambitious and enthralling story by one of science fiction’s most respected talents. Originally published in 1990, the novel remains a singular work in Kim Stanley Robinson's canon that engages his interests in the evironment and plumbs the absurdities of the human condition while charting unique narrative terrain. This anti-oedipal edition includes an insightful introduction by esteemed science fiction scholar and critic Robert Crossley as well as a study guide, both of which encourage readers to explore the literary prowess that makes A Short, Sharp Shock a rare gem of twentieth century American literature. KIM STANLEY ROBINSON has won every major award in the science fiction genre several times over. He is the author of more than twenty books, including the bestselling Mars trilogy and the multi-award-winning 2312. In 2008, he was named a “Hero of the Environment” by Time Magazine, and he now works with the Sierra Nevada Research Institute. He lives in Davis, California.